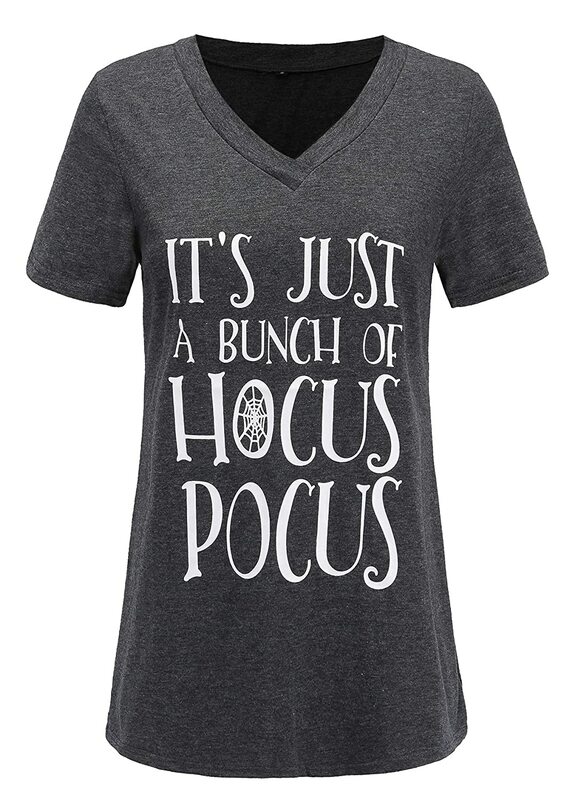 Plus Size Halloween T-Shirts Women Love! 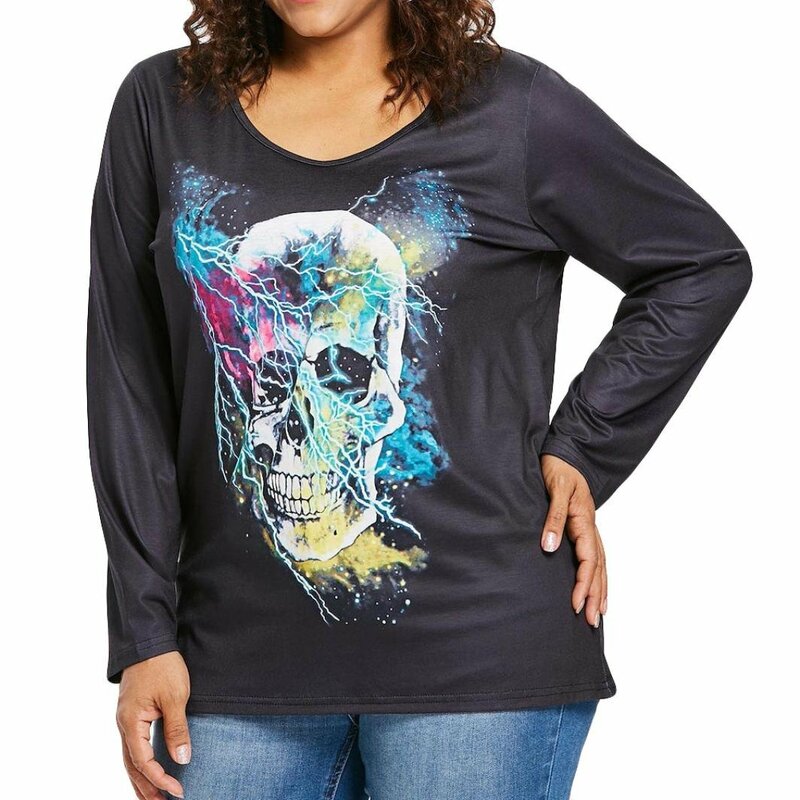 It doesn’t have to be hard to find plus size Halloween T-shirts women love when you shop at Fashion Prestige! We’ve got the goods you want, saving you time and energy running from store to store getting ready for the holidays! For example, take this adorable pumpkin t-shirt that comes in sizes small to 3XL. I used to have a t-shirt something like this; however, I had bought it in the men’s department. It was fun to wear, but did not have the feminine shape of this cute top. 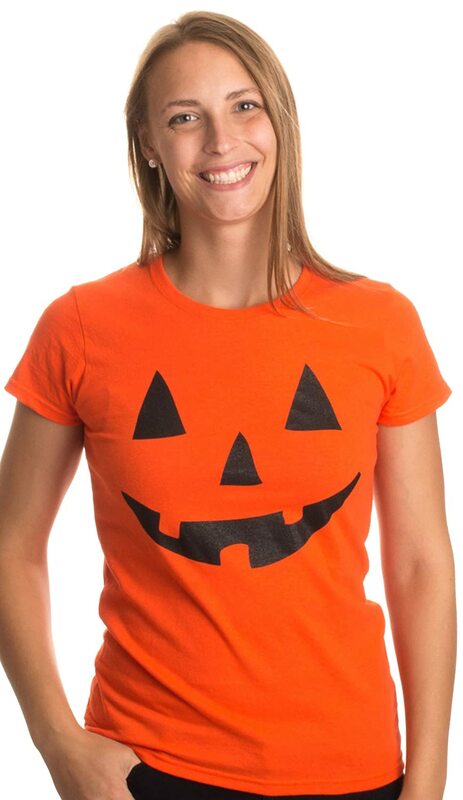 This cute Jack O’Lantern top is made of 100% cotton and is also made in the USA, so that’s a plus! Some reviews mention it runs a little small, so consider ordering up a size. Get your bling on, girl! This black, v-neck tee is available in a number of different Halloween designs, each one just as sparkly as the one before. My daughter loves her bling, so I know she would love this top. The trouble will be picking out just one! They are all so cute! Which design is your favorite? This top is available in sizes small to 3XL. The shirt comes in black only, but there are seven cute Halloween designs from which to choose. 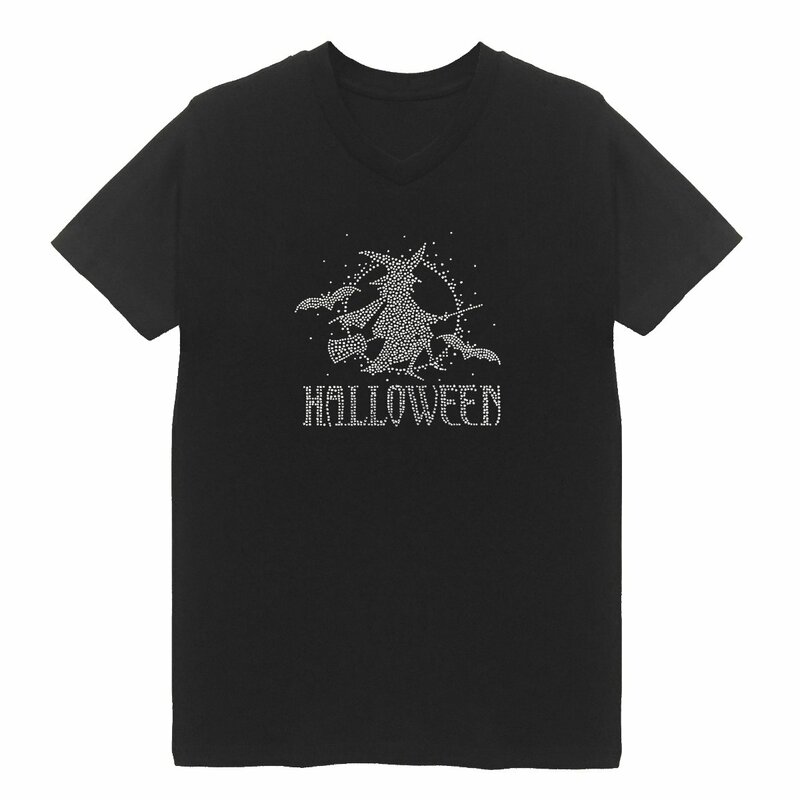 Cast your spell in this plus size Halloween t-shirt for women! It comes in sizes small to 22W-24W. I like the flattering v-neck and the color grey is one of my favorite colors to wear. The hocus pocus theme is cute. This shirt festively carries out the holiday theme without being garish. You could add a couple of witchy accessories and be ready for work on October 31st. 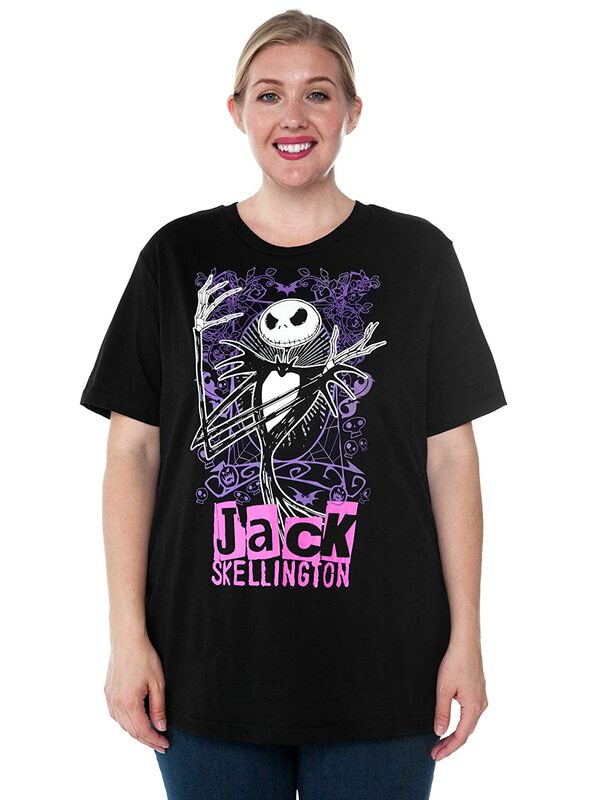 You will love wearing this fun Halloween t-shirt that runs from plus size 14/16 to 30/32. 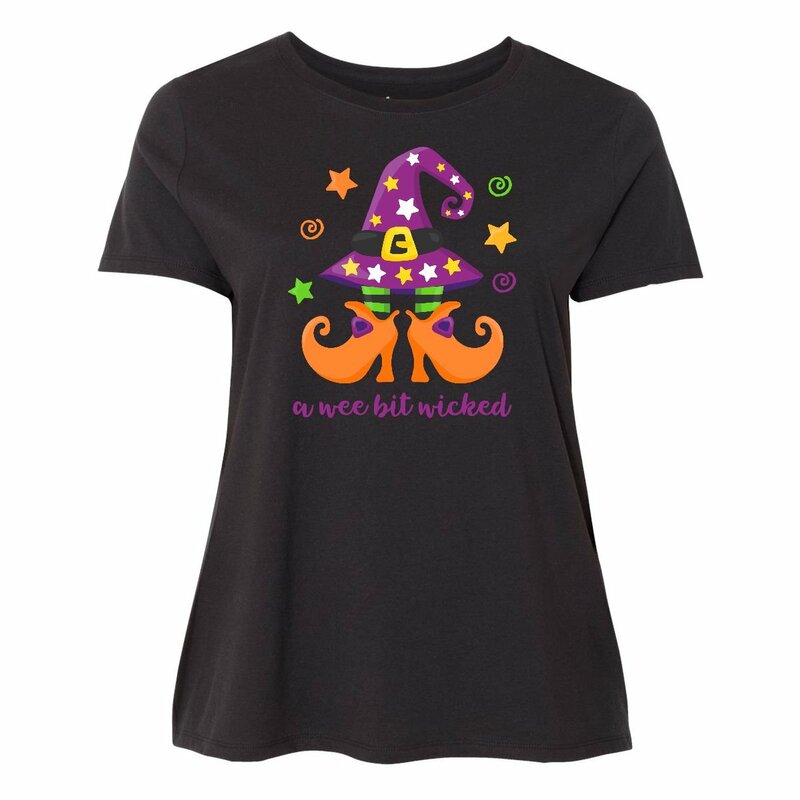 The whimsical witch design will bring a smile to all but the grumpiest gremlins, and they will wonder what wickedness you have up your sleeve! This top comes in several different colors besides black. Disney fans can get their Mickey Mouse on with this plus size Halloween t-shirt! 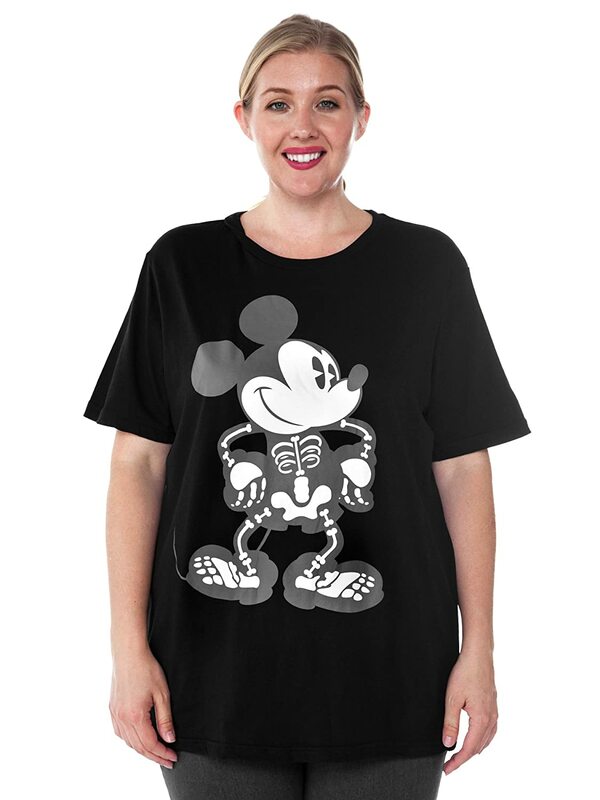 It is available in sizes 1XL to 4XL and features a skeleton of Mickey doing his thing. So cute! The image is a screen print, so it won’t crack and fall apart in the wash. I hate when that happens! I confess, I have never seen this movie, but if you are a fan of Jack Skelllington, this might just be the scary t-shirt you need this Halloween! It is also available in sizes 1XL to 4XL. It’s so cute and spooky! I don’t know where you are, but Halloween is cold where I live. More than once it has snowed on us while we were out trick or treating. If that is the case where you live, you might appreciate this Halloween t-shirt with long sleeves. This great top, with its creepy skull design, comes in sizes medium to 5XL. It can be especially tough to find the extended sizes in cute styles. I really like this one. It looks soft and comfy too! Make your own plus size halloween t-shirts women, kids, men…anyone will love!!! If you don’t like any of the designs above, you might feel crafty enough to make your own Halloween t-shirt! This video has some cute ideas that doesn’t really look that hard. 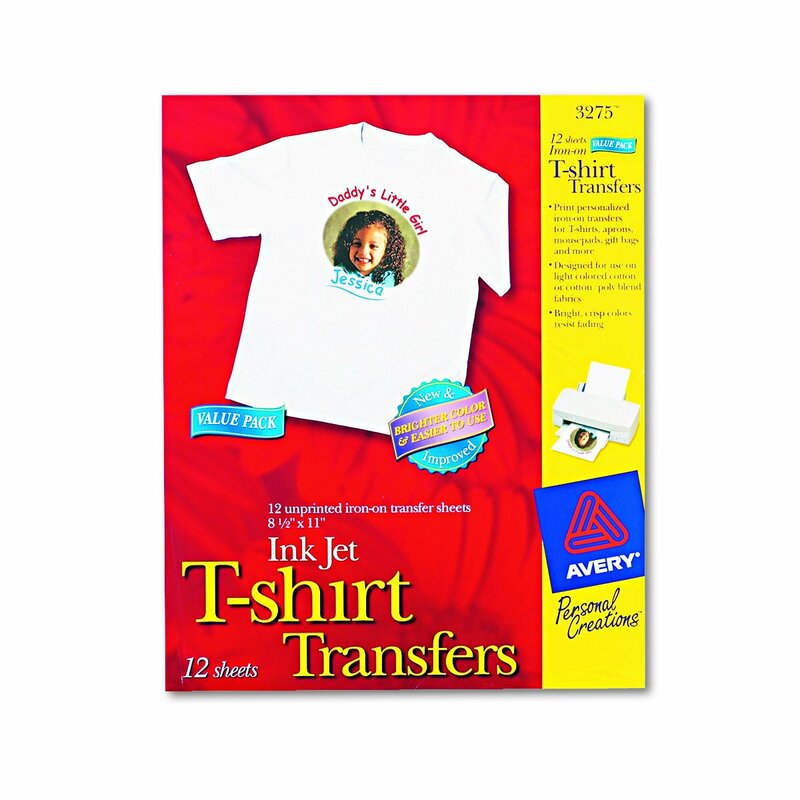 You are going to need some transfer paper which I will link to below to make it easy for you. I hope you found exactly the plus size Halloween t-shirts women like you love! Have lots of spooky fun and get lots of candy!! Plus Size Patriotic tops -- Show Off Your Love for the USA!!! Empire Tunic Tops in Plus Size are Great This Season!